This past weekend, I celebrated my 27th birthday. So naturally, I had to make a chocolate cake to celebrate. And before you go thinking “omg she made her own birthday cake that’s so sad,” no, my mom made me the best carrot cake in the world. So this girl actually got two cakes. I’ve been a fan of chocolate cake ever since…well to be honest it was probably since I watched Matilda and saw that sinfully rich chocolate cake Mrs. Trunchbull made Bruce eat (yes, it was a horrific scene, but can anyone deny that that cake will go down in history as one of the most salivating chocolate cakes ever?). Even though growing up I preferred cookies and brownies to cake (I know, I should’ve been checked out by a doctor, what was wrong with me?! ), homemade chocolate cake was always the one exception. I just loved chocolate cake. So every year for my birthday, I ask for a chocolate cake. Now. This chocolate cake is special for a few reasons. It’s a Blackout Cake. Meaning it is made with dark cocoa for that super rich look. It’s sky high, but only has 2 layers, making it easy to assemble. It’s made with brewed coffee for added richness and depth of flavor. 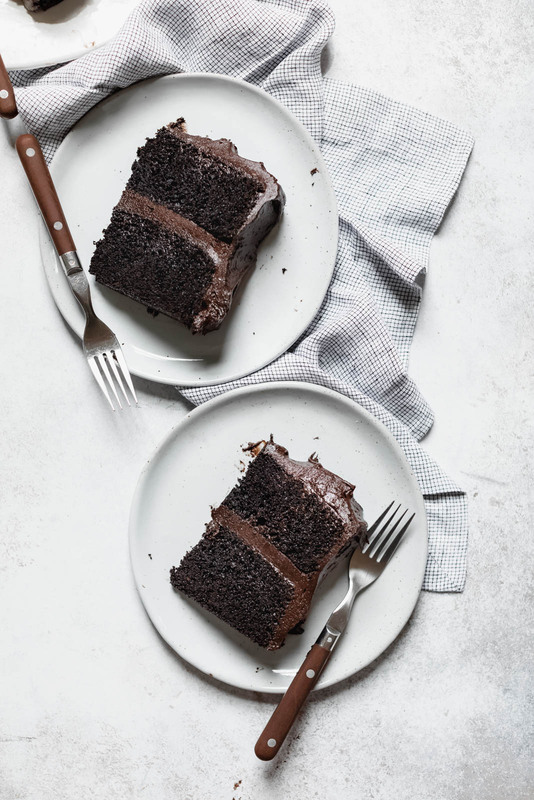 The homemade chocolate frosting has cream cheese in it (seriously, you’ll never want to make another frosting again once you have it so hear me out), which imparts just a subtle tanginess and adds to the creamy factor. 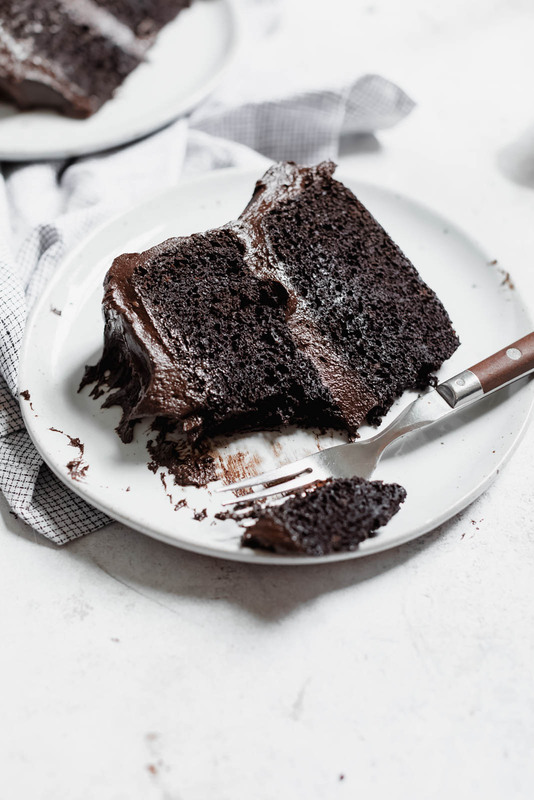 Basically, it’s a Blackout Chocolate Cake fit for a queen. Which, on one’s birthday, one should be. 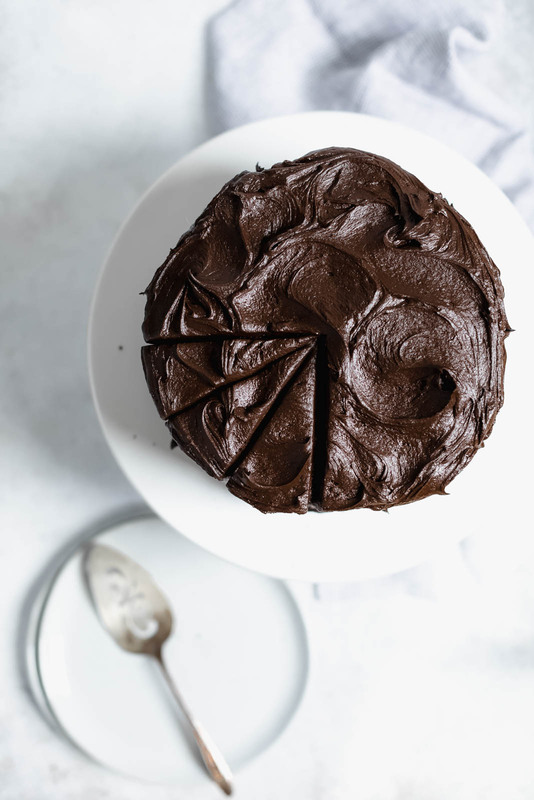 This chocolate cake is super easy to make, but you have to use the ingredients I specify (i.e. don’t use regular cocoa powder instead of dark cocoa powder, etc). 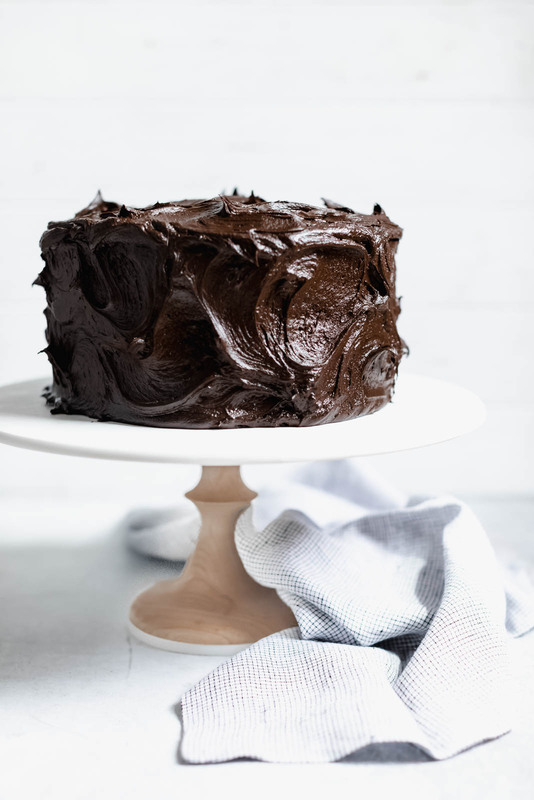 To make a true blackout cake, you need that blend of ultra rich cocoa powder and coffee. Omit either of these ingredients, and you’ll be left with a regular chocolate cake! (Totally fine on a normal day, but for your birthday you need the real deal). If you’re not a coffee drinker, don’t fret. 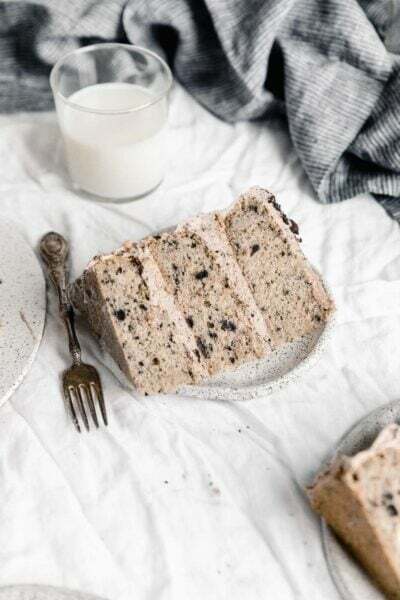 This blackout cake doesn’t taste much like coffee, but it does make this cake super flavorful. Real buttermilk is another key ingredient in this cake recipe, as it makes the cake extra moist and adds a subtle tang to the batter. If you’re in a pinch, a buttermilk substitute will work, but the real stuff is preferred! Don’t be scared of homemade frosting! To make a truly epic chocolate cream cheese frosting, you need to make sure all the ingredients are at room temperature. Set everything out on the counter while your cake is in the oven, and by the time you’re ready to make the frosting the butter and cream cheese should be the perfect temperature! Also make sure your coffee is room temp, as it’d otherwise make an absolute mess of your chocolate frosting. 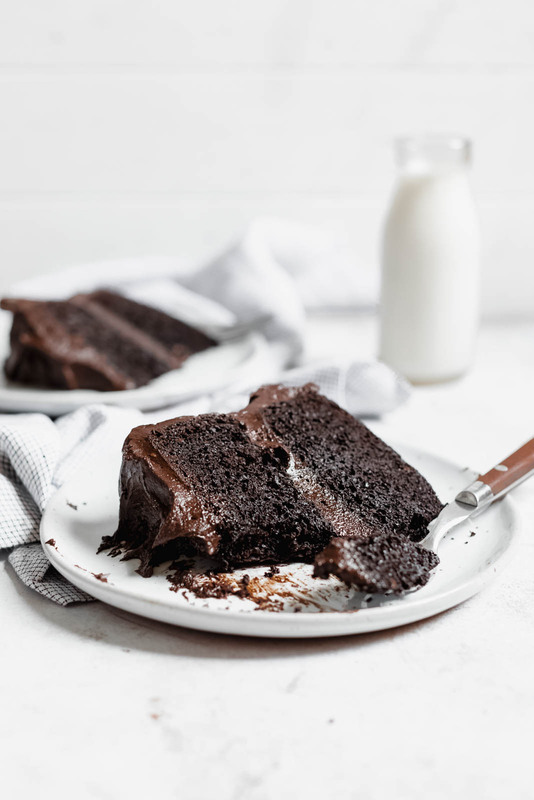 The Blackout Cake to end all other chocolate cakes. 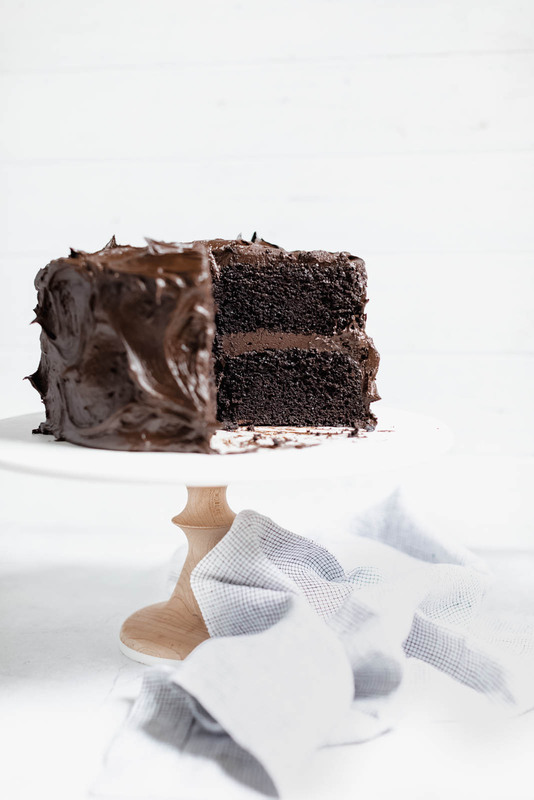 AKA a moist as heck chocolate cake with a sinful chocolate buttercream frosting. Preheat oven to 350°F. Grease and line two 8-inch cake pans with parchment paper. In a large bowl, whisk together sugar, cocoa powder, flour, baking soda, baking powder, and salt. In a separate bowl, whisk oil, eggs, and buttermilk. Pour the wet ingredients into the dry, whisking until no lumps remain. Pour in brewed coffee, mixing until just combined. Pour batter into prepared pans and bake for roughly 30 minutes, or until a knife inserted in the center of the cake comes out clean. Cool completely on a wire rack before frosting. To make the frosting, place butter and cream cheese in a standing mixer fitted with a paddle attachment (an electric hand mixer also works). Cream on high speed for 1 minute, then turn speed to low and add in cocoa powder. Mix until combined, then add in powdered sugar, brewed coffee, vanilla extract, and salt. Cream on high speed for 1 minute, until mixture has lightened slightly and is fluffy. Frost cake by placing first cake layer onto a cake stand. Top with a healthy dose of frosting. Spread evenly, then repeat with second layer. Use remaining frosting to frost sides of the cake. Last, use the back of a spoon to create a large swirling pattern all around the cake! Sounds fantastic other than the coffee….what can I substitute for the coffee, as I am unable to have anything with coffee in it. You can sub hot water! Delicious! 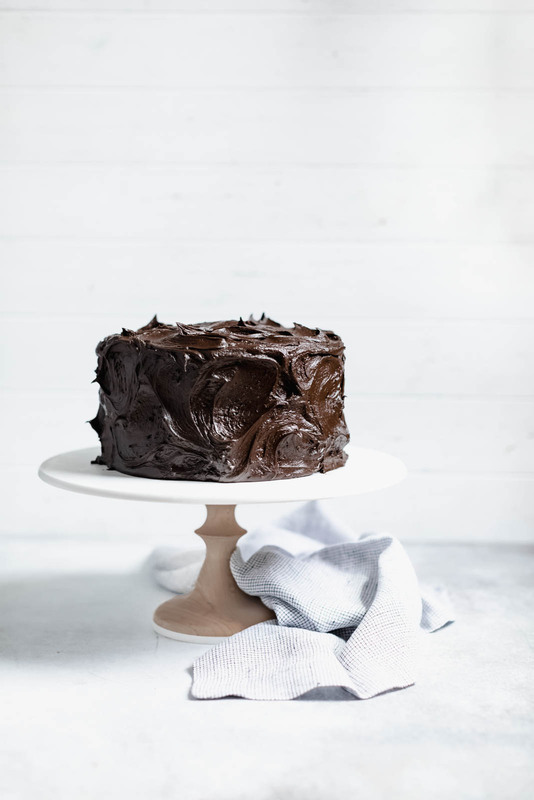 A sky high moist dark chocolate cake…YES! Oh my goodness this looks AMAZING! I don’t have a go-to chocolate cake recipe, so I’ll have to try this out! I’m in on this one! Looks superdelicioso 😉 Happy Birthday! Looks devine!!!!!! 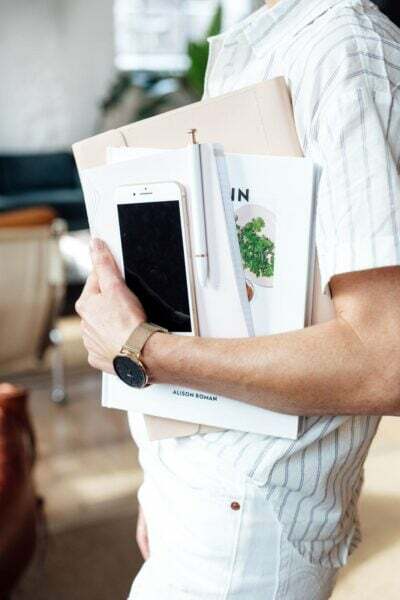 Would you consider adding photos to the printouts?! Can the coffee be substituted? Or completely removed? I don’t like the taste of coffee at all ???? You can use hot water instead! I’m planning on making this. Do you put the bottom side up to frost?? I’m not knowledgeable about Drost a two layer cake. I’d like to learn a good method. Yes, that’s a great way to do it! Sarah – I just made this. My icing didn’t turn out nearly as dark as yours. I’m not sure why. Any tips? It’s like you read my soul….cream cheese chocolate frosting?!?! Yes please. Cannot wait to make this! By dark cocoa powder do you mean dutch process cocoa powder? Thanks! Definitely looks like the best ever! Hi. Can you help me to convert the cups into grams? I want to make the cake, but I am used to weight all the ingredients. I don’t convert, but there are many websites online that do! I’m all over this. Literally the cake of my dreams! Dying over that frosting! Those swirls!! Someone gave me this recipe about 3 years ago and I will never make another chocolate cake. I use hazelnut flavored coffee and sometime frost with a chocolate ,mocha buttercream, depending on who I’m making it for. 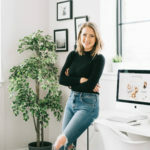 Love your website and recipes!! I’m obsessed with that frosting, what an incredible cake!! Brilliant. 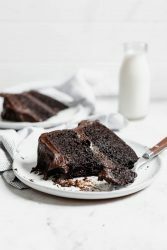 Thank you for the Blackout Chocolate Cake recipe and share your feeling. This is probably the best chocolate frosting I’ve ever had. I think the cream cheese and coffee just add such an excellent addition to a typical buttercream frosting. My honey asked for “death by chocolate” for his birthday dessert and this certainly filled the bill. I did three 6″ layers and I probably needed to chill the frosting a little bit as it was hard to make the decorative swirls. Lord that’s a lot of butter in the frosting – but no one complained, lol. He absolutely loved it, so thank you for all the points I scored. I now have to do some drive-by “caking’ on neighbor’s porches though – this cake needs to be shared and I can’t have it taunting me every time I open the fridge. Can butter be subbed for veg oil? Yes! I’d use melted butter! Hi sarah, can we substitute the buttermilk with something else ? You can always make your own buttermilk by mixing 1 tablespoon of lemon juice or vinegar for every 1 cup of milk and letting it stand for 5 minutes. This recipe looks divine! I’m a huge fan of the chocolate and coffee combination. I would love to make this cake to exact specifications. I am from Toronto and I am having trouble getting Hershey’s special dark cocoa powder. Would alkalized black cocoa powder or callebaut dark cocoa powder work? Definitely! Any high quality dutch processed cocoa should do the trick. I’ve never used either of those with this cake, but it looks like Callebaut dark cocoa powder might be a little more similar. Let me know how it goes! I made this and LOVED it– and I DO have an amazing go-to cake. But what I loved was that this cake is not super sweet or very dense. It was surprisingly light (which meant I ate WAY too much!). Here’s my question: how does it do in cupcake form? Please let me know and please keep on providing amazing recipes!!! Thank you! So happy to hear you loved this cake just as much as I do! Do you also use Hershey’s special dark cocoa in the frosting or just regular cocoa? And what kind of flour in the cake? Cake flour or all purpose? I did! You could also use another dutch processed cocoa as substitute. Did you use all purpose flour or cake flour? And did you use dark cocoa in the frosting as well? Or regular cocoa? All purpose flour! You could definitely use cake flour too though if you have it on hand! I used dark cocoa powder to get that rich chocolatey look, but regular cocoa powder would work just fine too. Hope this helps! Oh no! Make sure the coffee is at room temperature so that it doesn’t melt the butter in the frosting. You could also always add a little more powdered sugar to stiffen it up a little more. What’s a good substitute for buttermilk in this recipe? Thank you in advance ???? You can make your own buttermilk by mixing one cup of milk with 1 tablespoon of white vinegar or lemon juice. Stir together and let stand for 5 minutes. I’m making this for my kids for Valentine’s Day! My cake pans are 9”. It will be a thinner layer i imagine, but how much should I adjust the baking time? Any other changes i should make? Great question and good thinking! You shouldn’t have to change anything other than baking a few less minutes. Just keep an eye on the cakes to make sure to not over bake. Hope this helps!